Buddhists teach that all things arisen in dependence on a cause and supporting conditions will display three qualities or characteristics, viz., aniccaṇ, dukkhaṇ, anaṭṭā, interpreted to mean, respectively, impermanence, that is, that they’re prone to change and transformation, that they’re hard to endure, hard to bear with because of that, and that they’re empty of any abiding ‘self’ principle. We, lacking knowledge, and given our mental abilities, will quickly fall into assuming that there is an abiding ‘me’ involved in the living of life, thus turning our backs on the first and third of these signs and turning the second, that of dukkhaṇ, into a life-long problem. Attempting to live ‘artistically’ can prevent this to some degree, and perhaps put an end to it once and for all. Aniccaṇ understood as impermanence, as change and transformation, refers to all things arisen in dependence on a cause, sentient or otherwise, but it’s the insight into the impermanent nature of mind, arising and passing away with each succeeding sense experience that constitutes the essential understanding, without which there’s non-knowledge, or ‘ignorance,’ leading to ‘self’-belief and lots of problems. What’s aniccaṇ is also dukkhaṇ: life is an impermanent experience, always shifting and changing, always ‘up and down,’ as it were, hence we, once born, have to grow up, mature, and eventually grow old, along the way being faced with the pain and discomfort accompanying the various forms of sickness, sometimes light, sometimes heavy. Then there’s the problem of dissatisfaction, a feeling which must always follow any satisfaction we might experience, thus we eat and we’re satisfied, but not for long; we drink but we can’t just drink once, and so on. Everything we experience will be ultimately unsatisfactory, even the breathing has this quality, hence we’re always in motion, doing whatever we have to just to stay alive and healthy, which as we age will become more of a problem as the body degenerates, etc. It’s because of all this that being alive is said to have its ‘hard to endure,’ ‘hard to bear with’ quality, which, if allied to ignorance of the third quality or characteristic, that of aṇaṭṭā, leads to the form of dukkha which manifests as excessive mental disturbance, sometimes strong: anger, jealousy, envy, fear, anxiety, etc. sometimes weak, perhaps a lack of self-confidence, loneliness, alienation, a general uneasiness, an inability to be at peace with ourselves which manifests as a scattered mental state, a lack of mental energy, confusion, doubt, irritation, lustfulness, the gentler examples of which are, courtesy of the consumer system, easily endurable. Anaṭṭā has the meaning of ‘not-self,’ which means that what’s living life isn’t ‘me,’ and if we could live with that natural understanding then all we’d have to deal with would be the basic problems, the ‘hard to endure’ variety mentioned above. Of these three concepts aniccaṇ, at least on the obvious level is quite easy to accept; dukkhaṇ, as the basic nature of our lives is harder to deal with, while anaṭṭā, translated as ‘not self,’ almost always presents problems for people. According to Buddhists the ‘self’ doesn’t really exist, at least not in the way we would normally assume that it does. It’s quite possible that it arises from a misunderstanding of the basic survival instinct that all living things have, which in the human case, given our mental abilities plus the careless way we live our lives, gets repeatedly misunderstood and expanded into the ‘ego,’ into the ‘I am,’ into the ‘soul,’ or ‘spirit’ which abides, which always exists, day in, day out right throughout a lifetime, and, perhaps, survives death too. We’re actually an ongoing ‘process,’ for want of a better word, a process that involves a combination of natural processes, five continually interacting natural processes known as the aggregates, or khandhās, which are: form, or ‘materiality,’ the rūpākkhandhā, represented by the physical body and, because of the way we experience, by the material world generally; feelings, the vedanākkhandhā, the pleasant, unpleasant, and neutral kinds of feelings that give flavour to any experience; perception, the saññakkhandhā, the ability to discriminate, to recognize; thinking, the sankhārakkhandhā, active thinking; and consciousness, or awareness, the viññānakkhandhā, which makes up the quintet. But there are only these five functions; there’s no ‘me,’ no sixth aspect, no abiding ‘self’ directing operations, causing or experiencing the physical activities, feeling the feelings, doing the recognizing, no ‘me’ who thinks, who is aware, say Buddhists: there’s the physical body with, arranged on its surface, the organs of sense, that is, the body surface itself, the eyes, the ears, the nose, and the tongue. Outside of the physical body is the physical world wherein are the sense objects that the sense organs can interact with, the sights, sounds, smells, tastes, and tactile experiences, and, whenever that happens it will be the condition for sense-consciousness to arise and know that it has happened. Consciousness here is sense-consciousness, of which there are six kinds, each sense having its own consciousness, hence there’s, eye-consciousness, ear-consciousness, nose-consciousness, tongue-consciousness, body-consciousness, and mind-consciousness, six kinds. Consciousness will occur quite spontaneously as a result of the sense organ meeting its object. This won’t require any help, it will just happen because that’s the way things are put together. From the meeting together of sense object, sense organ, and consciousness will come a feeling of one sort or another, either pleasant, unpleasant, or neutral. Once again this simply occurs: there’s been a meeting together of sense organ, object, and consciousness and this causes a feeling of some kind to happen. Nobody ‘feels’ the feeling, there’s just consciousness of it and, once that’s happened, there will occur perception to perceive, to recognize it’s quality, to make sense of it, as well as making sense of whatever it is that’s being experienced. Again, perception will quite naturally occur because the conditions are there for it to occur, perception is simply the next link in the cognitive process. From any perceiving, any recognizing that’s done will come thinking, active thinking, which will perhaps bring about a definite focusing of attention onto the object being experienced which will then give rise to more of the same, to feeling, perception and thinking all over again, and again, and again, and to some form of a response either physically, verbally, or both. But, whatever happens, say the Buddhists, there won’t be a ‘me’ involved in the event. So, there’s no ‘me’ here, no ‘self’ performing the physical activities, doing the feeling, the recognizing, the thinking, and no one being aware, it’s the khandhās, the aggregates that do the living. For instance, when we have to wake up in the morning it will be these five groups doing the waking up: First the ear will pick up the sound of the alarm bell, both of which, the ear and the sound of the bell will be the physical, the material aggregate operating. Along with that will be awareness of the process of hearing taking place, which will be the consciousness aggregate doing its job. Consciousness in this instance will be ‘ear consciousness.’ A feeling will arise, perception will discriminate, recognize, make sense of what’s going on, then pass the data, as it were, to the thinking aggregate, a response will follow and we’ll then get up, or whatever. And that’s all there’ll be: a process of nature occurring because the conditions are around for it to occur. It needs to be mentioned here, that the aggregates aren’t ‘things,’ they’re processes, we might say that they’re ‘things’ in process, continually undergoing change as with all else in nature, dependent on sense experience, and never existing in any stable, unmoving state. It’s our continuing ignorance of our true nature that keeps dukkha in our lives, and which keeps us seeking after the pleasant, the stimulating in order to escape from it. It’s this ‘seeking after,’ or desire, known, if it’s ignorantly based, as ‘taṇhā,’ which causes the problems by providing the essential link in a mental reaction known as paṭiccasamuppāda, or ‘dependent origination,’ which takes place whenever we meet with any sense experience interesting enough to cause the mind to pay attention. ‘Experience’ here refers to any sense contact, that is, a meeting of a sense organ, sense object, and the appropriate sense-consciousness. There are two distinct stages in any sense contact, but it’s the second instance, the contact of the experience with the mind, that we’re interested in here, because when ignorance is in charge this is where the problems come from. From this sort of contact comes feeling, but ignorant feeling, that is, a pleased or a displeased feeling. Feeling pleased, or displeased provokes desire, ignorant desire – taṇhā - to get more or to get less depending on the feelings being experienced. Taṇha, usually translated as craving, is however, three-pronged, being craving for sensuality, kamataṇhā, craving for existence, bhavataṇhā, craving for non-existence, vibhāvataṇhā. Taṇhā gives rise to upādāna, attachment, or clinging, which is what causes the desire to be or not to be to assume a more concrete form, in that it’s here that the ‘self’ sense becomes obvious for the first time during the course of any experience capable of provoking it. Quite why ‘clinging’ causes the feeling of being ‘me’ to appear has to do with those two poles of desire – desire for existence, to ‘be,’ and desire for non-existence, to ‘not be,’ in that, whenever mind clings to anything unwisely then whatever’s being clung to will provide the necessary basis for the, for instance, desire to ‘be’ to ‘grow up,’ as it were, to become obvious. If there’s no clinging then there’s no base for the ‘self’ to develop in dependence on. It’s much the same way with anger, for instance: to be angry we have to have something to be angry about, some experience to become angry in dependence on. ‘Clinging’ then gives rise to, or ‘conditions’ ‘becoming,’ ‘bhāva,’ which is where the now obvious ‘self’ sense continues its ‘growing-up’ process. Every meaningful experience we undergo provokes deliberated action – kamma - of some sort in order to get, or get away from whatever’s being experienced, ‘becoming’ is the point in the process where those actions, verbal, physical, mental take place and as they do they cause the arisen ‘self’ sense to take on the identity, to ‘come into existence’ as the ‘experiencer’ of whatever’s being experienced. All this culminates in ‘birth,’ or ‘jāti,’ not, however, of a baby into the world, but of the concept of ‘birth’ - so that nothing actually gets ‘born’ in either a mental or physical way, rather this process, because it rolls perpetually in the ignorant human mind, is what keeps alive the ‘self’ illusion – the illusion that there was a ‘me’ born however many years ago, and who is, and has been living life moment by moment, day by day, year in, year out ever since, and who is, because of that, always going to be faced with the inevitability of ageing sickness and death, etc. that is, with dukkha. We simply assume that there’s always a ‘me’ doing the living of life, and that it’s the same ‘me’ experiencing from the cradle to the grave, but, it seems, it’s only when we ‘cling’ to whatever we happen to be experiencing, it’s only when the mind takes hold and won’t let go that the ‘self’ sensation will begin to dominate. That which we call the ‘self’ is really just a feeling, just a thought which arises into the mind whenever any unguarded meaningful experience occurs, it’s not waiting around anywhere to do the experiencing. Thus, in the case of food, if we’re perhaps bored and happen to think about eating a pizza that will produce the necessary stimulus, that is, it will cause a pleasantly stimulating feeling to arise into the mind which will provoke the appropriate desire, of all three kinds, clinging will naturally follow providing the base for the ‘self’ sense to grow up in dependence on. Now, before clinging happens one could say that it’s just the mind functioning ignorantly, operating in a ‘dualistic’ manner but without any definite feeling of being ‘me’ - that is, there’s already a ‘subjective bias’ to experience, but it’s only when clinging takes place that the subjective bias starts to become ‘me,’ to become obvious. Compare this to a physical pregnancy, in that the child can develop in the womb for some time before it becomes obvious that a woman is pregnant. As we’ll see a little later it’s the same with the development of the ‘self’ in the mind. However, ‘clinging’ then conditions ‘becoming,’ which represents the actions, that is, any deliberate thinking, speech, and physical activity – kamma - that might be necessary to get what we desire. It’s in this way that self sense ‘grows up’ in the mind. ‘Becoming’ happens more or less continually during our waking hours, and is the necessary condition for ‘birth.’ ‘Birth’ as mentioned, represents what we believe happened to us at the beginning of life - that there was a ‘me’ born so many years ago and this same ‘me’ has been living life ever since. This is delusion, illusion, just an unreasoned belief which is sustained by the continual seeking after stimulation we indulge in. In reality the feeling of being ‘me’ is always bubbling up in dependence on the experiences we pursue, but, because we cannot experience this as it really happens we just assume that the ‘me’ is always present. This kind of ‘birth’ thus becomes the condition for life - for ‘ageing and death,’ etc. to become a problem, to become dukkha. It’s actually the mind and the mind alone experiencing life; the Buddhists are trying to point out with this teaching that, in reality, there is no abiding ‘self,’ it’s just a feeling that arises and passes away as each and every stimulating experience arises and passes away, and if we didn’t chase stimulation continually then we wouldn’t have this problem at all, there’d be life but there wouldn’t be a ‘me’ to experience it. But we, ignorant of all of this, do chase stimulation, and continually, so that, just like a monkey moving through the jungle, swinging from branch to branch, letting go of one branch and taking hold of another as it fares on through the trees, we must ‘become’ continually, now in this way, as the eater of the pizza, now in that, as the watcher of a film, now in this, as the reader of a book, now in that, as the listener to some music, now in this, now in that, and so on and so forth, from experience to experience to experience. And this continual ‘becoming’ can easily maintain the illusion of an abiding ‘me’ who lives life day by day, year on year, who’s always going to be faced with the prospect of ageing, sickness and death, with the ups and downs of everyday life, and with the mental stress and tension that will inevitably accompany that. But there’s more to dependent origination than meets the eye: Whenever the craving, clinging, becoming and birth scenario occurs it strengthens the forces called ‘defilements,’ the ‘sub-conscious’ traits or tendencies that are themselves the results, or ‘vipāka,’ of all that ‘becoming,’ of the intentional activities, kamma, of mind, speech, and body indulged in over the years of our lives right from the time we were small children. A baby will begin it’s development simply by being without any useful knowledge when it’s born from the womb. ‘Useful’ knowledge here would be the knowledge of how to respond to life so that unnecessary problems don’t arise. Nobody has this knowledge at birth, and usually we don’t acquire it during our lives either, which means that we must go on behaving in the same misguided ways right up to the time that we die. Buddhist monks recite a series of ‘reflections’ on the four necessaries of life. One of them is a ‘food reflection.’ The food reflection reminds them that they’re not eating to enjoy, to be delighted, or stimulated by the food in any way. That’s the source of all our problems, say the Buddhists, finding delight, or stimulation in the things we see, hear, smell, taste, touch, and think about - delight which then causes that unnatural desire, taṇhā, for more of the same. It’s this desire that causes the mind to repeatedly produce the illusory ‘me’ who’s doing the experiencing. The feeling of being ‘me’ is always illusory and is constantly coming and going from the mind. It arises, develops and then completely disappears. But, there’s always something left behind, as it were, something which doesn’t disappear, this, they tell us, is the source of the three ‘root defilements’ of greed, hate, and delusion: greed, loba, develops from our continual desiring after stimulation of whatever sort, aversion, dosa, from desiring to get rid of or to avoid anything not stimulating, and delusion, moha, from our lack of knowledge of the right sort, which means from simply being born and then living life in the way that we do. These monsters begin to develop when we’re just tiny little babies, because even a baby, once it’s been introduced to the possibility, is quite capable of finding delight or stimulation in its experiences, and the first time it does that it will, first of all, create the feeling of being ‘me,’ and, as a consequence, start the growth of the root defilements. This probably begins to happen quite early on in the child’s life, perhaps as a result of the child simply being fed and, especially, from being coddled and made a fuss of by it’s mother, and will then continue to develop throughout the child’s life. It’s worth noting here that we’re actually encouraged to live our lives in a way that will exacerbate the problem: parents, while unaware of the results of their actions, lead their children down the primrose path to perdition simply by treating small children in the way that they do, then the education system and the general trend of life in modern capitalist systems encourages people in the sort of lifestyle that will increase selfishness, dukkha, and continually strengthen the defilements. These defilements, manifesting as habitual responses to sense experience, first press to ‘inflow,’ that is, to enter the conscious levels, doing that on the back of any unguarded sense experience, and when they do enter it’s in three main streams, those of the inclination towards ‘becoming,’ towards ‘sensuality,’ and towards ‘ignorance.’ ‘Becoming’ is like a drug for us, blossoming as the constant tendency to be doing something, going somewhere, becoming this or that, being this or that, not becoming, not being, etc. It’s so difficult for us to simply be still and accept whatever’s happening to us without feeling that restlessness, that urge to be on the move in some way. The consumer system feeds on this, and encourages it continually. Sensuality is obvious enough, sensual stimulation being another drug we get hooked on, while ignorance, the third ‘inflow’ is delusion in motion; ignorance is dynamic, a moving force inserting itself into experience continually, thereby allowing us to ignore the inconvenient promptings of our conscience. These ‘inflows,’ the defilements manifesting on the conscious level, will cause both the inner and outer worlds to take on a significance they don’t possess, and also guide any response we make towards our experiences, keeping us always locked into a certain basic mode of behavior - which means stimulation seeking. All of which has to mean that our ‘free-will’ is necessarily limited to the choice between this, that, or the other stimulating experience widely available courtesy of consumerism. 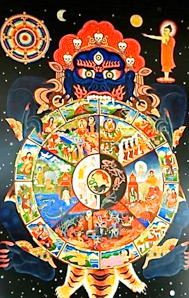 Those people who engage in the Suan mokkh Nanachat retreats are shown a picture of the ‘wheel of becoming’ (the aforementioned paṭiccasamuppāda, dependent origination) at some time during that business which illustrates the process that gives rise to dukkha. The illustration is supposed to illustrate, using imagery, the way the mind, in dependence on avijja, ignorance being present, develops the ego sense and associated problems. So, let’s take a slice of experience, just one experience and the mind’s reaction to it, and as we do, recall the reference to the pregnant woman mentioned above because what follows has parallels with the way the egg in the womb divides and develops before it takes on the appearance of a human infant. So, given ignorance, avijja, a simple, as with the baby, lack of knowledge, arise the formations, the sankhāra. The formations are the conscious level of defilement, and once arisen into the mind start it immediately moving away from its true nature. The defilements, or inflows, disturb the mind (think of the nivarana,) and bring a subjective bias, or inclination with them, hence this represents the very beginning of the ‘self’ illusion, this is the moment during the course of just one experience, when the mind loses the ability to operate as it should and acquires the ability to create, to go its own way, as it were. It’s at this point in the mind’s response to sense experience that we lose the ability to do our duty as true human beings, to just take life as it is and live taking what we need, as all creatures, except us, do. The ‘formations’ will grow up into the deliberate activities of body speech and mind all ignorant humans display, the kamma formations, but here, as the sankhāra, they represent the arising in the mind of the ability to act in kammic ways. Viññāna, consciousness, is the condition for ‘nāmarūpa.’ ‘Nāma,’ or ‘name,’ and rūpā, or form is the world that the ignorant version of consciousness brings with it. It represents reality mixed up with the defilements, and is the world we normally experience moment by moment right throughout our lives. To keep it simple, we can explain ‘name’ and ‘form’ as the names and forms we normally experience every day – like a ‘tree’ for instance: ‘tree’ is really no more than a ‘name,’ it’s not a reality in itself because Nature doesn’t know anything about ‘trees,’ it’s a label we stick onto a process of nature and then in our ignorance go on believing in as being the reality of that process. The Buddha once held up a flower to illustrate this point. We can explain ‘form’ as the illusion of permanence, of niccaṇ: every human being believes that they live in a world of ‘things,’ that they are themselves some ‘thing,’ but this is an illusion, matter is an illusion say the Buddhists, there are no ‘things’ to be found anywhere, only things in process, we might say. ‘Name’ and ‘form’ thus represent the illusion of matter on two levels: that we live in a world of matter, of ‘things,’ is one illusion, and that these things ‘matter,’ that is, they have meanings associated with them, usually of being either ‘good’ or ‘bad,’ which is the second illusion. Name and form then condition the senses, the salāyatanā – again keeping it simple - into operating as ‘inner,’ the eyes, ears, nose, tongue, body, and mind, and ‘outer,’ the sights, sounds, smells, tastes, and touches and mental objects that we normally accept as being different from us. Now, when the mind is in the right condition it can, and quite easily, escape from the illusion that there are two things, an ‘inner’ and an ‘outer,’ an ‘experiencer’ and an ‘experienced,’ a ‘subject’ and an ‘object.’ The ‘inner’ and ‘outer’ scenario is an unavoidable result of consciousness assuming a dual function. So, now we’ve got an object – the ‘world,’ our ‘world,’ the one we ‘normally’ experience, and a subject, the ‘body’ and ‘mind’ combination to experience it, hence it’s said that the salāyatanā, the sense ‘spheres,’ condition contact, phassā, which is the meeting together of an ‘inner’ sense with its ‘outer’ object provoking the appropriate, subjective, form of consciousness. Remember that we’re dealing with a world of ‘name’ and ‘form’ here, both within and without, a world of ‘things’ that matter, and which are capable, if we’re not very careful, of provoking ‘phassa’ the sort of contact that will be a problem. Because the things we see, hear, etc. can now make us ‘feel,’ it’s said that phassa, contact, gives rise to, or is the condition for feeling, vedanā. This is not going to be ‘feeling’ as it really is, simple pleasant or unpleasant feeling, because nothing is as it really is in the world of names and forms, rather this will be, for instance, feelings of pleasure, of stimulation, of delight, or whatever, feelings of such a nature to provoke desire, the sort of three-pronged desire that’s also a part of the world of name and form - ‘taṇhā’ - then clinging will happen giving rise to a definite sense of ‘self,’ (remember the pregnant woman metaphor) which means that the ‘subjective’ nature of consciousness has now become obvious enough to give rise to the thought that it’s ‘me,’ ‘becoming’ then develops that into the full sense of ‘ego’ as birth is ‘born’ bringing with it ageing, sickness, and death, and so on and so forth. So, whenever there’s a sense contact and ignorance is in control, like the thought of a pizza, then, after the first passes of perception, the consciousness that will know the pizza will be the consciousness we’ve just described, etc. etc. Another way of looking at this is from the angle of the ‘defilements’ themselves, those sub-conscious forces known as greed, hatred, and delusion. The defilements ‘build up’ as a result of our constant seeking of stimulation. The point in the process of dependent origination where ‘clinging’ conditions ‘becoming’ indicates the arising of intentional, kammic, activity. Kamma means ‘action,’ intentional action, deliberate activities of body, speech and mind, the results of which are referred to as vipāka. It’s vipāka that’s of more interest here, because it’s this that ‘builds up’ the defilements which then regularly infiltrate our waking experience to cause the above mentioned distortions in the way we understand the things we see, hear, smell, taste, touch, and think about, as well as in the way we respond to them. The defilements do for our experience what MSG does for food, and can turn the triumvirate of aniccaņ, dukkhaņ, anattā effortlessly on their heads, enabling us to see the permanent, the stable, the enduring in that which is impermanent, unstable, and does not endure; to see the pleasant in that which is really unpleasant, and to see ‘self-hood’ in that which is void of any such meaning. Quite a bag of tricks, but then consciousness under the influence of defilement is described in the texts as a ‘juggler’s trick.’ Thus defilement is behind the illusion of permanence, of stability, stability being, as long as we remain ignorant, necessary to any happiness we experience, and happiness is the thing we seek continually. This influence is therefore obvious as far as the ‘self’ is concerned because ‘self’ existence and permanence go hand in hand, but it’s also projected into any experience we happen to find interesting enough to linger over, so that the world we experience as being outside of us seems to be a world of ‘things,’ all of which will have some meaning of ‘good’ or bad’ associated with them. Then, whenever there’s an ignorant sense contact the defilements will effortlessly guide mind into the craving, clinging scenario. Responses to the things seen, heard, etc., are instinctual responses, but instinctual responses can be and are regularly subverted by the defilements. Thus the mind, minus proper mindfulness, will always follow the path of taṇhā, etc. which means, as mentioned, that, in reality, our freedom of choice is severely limited: to be sure we have some freedom of choice, that is, we can choose what sort of stimulation we’re going to pursue, but we are going to pursue stimulation. That’s the bottom line. But this can only happen if we allow it to happen, that is, if we live life in an ignorant manner, simply allowing things to go along as they always have. It’s ‘contact,’ when the ‘inner’ world meets the ‘outer,’ that provides us with the opportunity of exercising real free-will, defying the siren call of stimulation and choosing the way of wisdom instead, because it’s when we see, for instance, anything that causes us to linger and get involved that the defilements can work their peculiar magic. So, if we’re careful, and we can do this simply by guarding the sense ‘doors,’ that is, by not allowing feelings of pleasure, of delight to arise into the mind from any experience, then, whatever we happen to experience, it won’t be able to cause dukkha. Hence the famous injunction in the texts to the man Bahiya who went to the Buddha for guidance and was told that when seeing just let the seeing take place, when hearing, limit it to simply hearing, and so on – that is, don’t let the defilements flood the mind and create their magic. In other words, learn to live artistically. It needs practice, and, if it’s to be effective, needs the correct motivation, because it involves striving to be ever mindful of what’s going on in life. Well, that’s what the Buddhist teaching is about – learning to live in such a way that we can put an end to dukkha, to ‘ageing, sickness, and death, to sorrow, lamentation, pain, displeasure, and despair, to having to associate with the unpleasant, being dissociated from the pleasant, to wanting and not getting what we want.’ Living life free from the ‘self’ delusion, minus the feelings of ‘me’ and ‘mine’ is what frees one from the problems associated with ageing, sickness, death etc., is what brings the experience of nirvāna. It’s the ‘self’ delusion that separates us from the natural world, that alienates, thus, nirvāna can, in a way, be understood as the end of that separation. Perhaps that means that, in the Biblical sense, we get to return to the Garden of Eden? Well, it might be one way to understand the Buddhist version of nirvāna? Adam and Eve were ejected from the garden because they came to be aware of the ‘good’ and the ‘evil,’ that is, they ate the fruit of the tree of the knowledge of ‘good’ and ‘evil’ that grew in the garden, and by doing that came to understand the sights, sounds, smells, tastes, touches, and mental objects they encountered as being ‘good,’ and thus stimulating, delightful, or ‘bad,’ and thus disgusting, repulsive or whatever. It was because of this, the ‘original sin,’ that they were ejected from the garden. According to the Book of Genesis it was God who ejected them, although it wouldn’t have been necessary for God to do that, because by losing the ability to experience both themselves and their world truly they actually ejected themselves, that is, once they became aware of the possibility of experience being delightful then they began to focus on its acquisition above all else, and because of that fell into the craving, clinging, becoming scenario and found themselves being ‘born’ into the world of ageing, sickness, and death, etc. which is really the Garden of Eden seen through the lens of ignorance, and were ‘born’ into it over and over again until it, in no long time, became their permanent place of existence. They were ‘ego’ born, and the mark of the ‘ego’ is separation, alienation. And so it is with us: the fact of being selfish separates us from nature. Nirvāna, then, would seem to indicate the end of that, which would be a kind of return to the garden. A return to the garden, but not in an ‘unknowing’ condition: ‘Good’ and ‘evil’ are the bait that lead the mind into the dukkha trap every time, but, if we’re aware of their secret then they lose their power. The mind which doesn’t know ‘birth?’ From one point of view ‘birth’ - or even ‘re-birth’ - is always about ‘ego’ birth, but there’s another, and much more popular, interpretation, viz., that birth refers to an after death state, that is, of some sort of carry-over from this life finding expression in a future, physical state of whatever kind after actual death has taken place. Now, it’s said that we can be born, or be re-born, in hell, or in heaven, or in the realm of the demons, or in the realm of the hungry ghosts, or in the animal realm, or - last but not least - in the human realm. These are the options open to us. How we understand all of this will depend on how we understand ‘birth.’ Certainly the usual understanding is that ‘birth’ refers to ‘rebirth’ into one of the above realms depending on our karma. For instance, there’s the possibility of rebirth into ‘hell.’ ‘Hell’ is a place, a place where great torture and distress is experienced, usually for a long, long time. It’s usually depicted as a hot place, although not always - however, ‘hell’ is usually associated with heat, with ‘hell-fire.’ It’s said that if we fulfill certain necessary conditions then, after death, we may well find ourselves in ‘hell.’ Unfortunately, or perhaps fortunately, it can’t be proved one way or the other that there is such a place as ‘hell,’ and it would seem that, even though the experience is said to be so intensely awful, no-one, that I know of anyway, has any memory at all of ever being there. The same applies to the normal understanding of ‘heaven,’ to a heavenly existence of whatever sort, where, perhaps we’re endowed with the ‘five chords of sense pleasure’ and all the time, where everything is delightful, and where this extremely pleasant existence goes on and on and on for ages. There are people who claim to remember their past lives as human beings, and, it seems, can sometimes remember the most mundane details, but nobody seems to remember being in heaven or hell, even though such experiences would seem to be of the sort that would make quite an impression. Surely, then, if recollecting past lives is about past incarnations it would be more likely that one would remember, at least in part, a past life of extreme duration and horror or of extreme duration and delightfulness rather than simple existence in a village somewhere or other? Then there is the realm of the ‘demons,’ the realm of the pretas, the ‘hungry ghosts,’ and the ‘animal’ realm. These seem to be less extreme ‘places’ than the hells and heavens. The asura or ‘demon’ realm seems to be a place where contention dominates. The ‘demons’ are depicted as being almost constantly at war with the ‘gods,’ whom they’re always trying - but never completely succeeding in the effort - to overthrow. The ruling passion there is said to be jealousy, although not everyone agrees about that and some insist that it’s really cowardice. The preta, or ‘hungry ghost’ realm seems from its depictions to be a sad, dreary place, peopled by rather strange, knobbly creatures with tiny pin-point mouths and enormous bellies. The point being that these creatures can therefore never get enough through their tiny mouths to satisfy the constant cravings of their enormous tummies, so that being ‘reborn’ in the preta realm means having to endure a life of constant dissatisfaction. The animal realm is also a realm of deprivation, and presents something of a problem. Animals have the mark of stupidity - perhaps ‘unknowing’ would be better - but, apart from that it’s rather difficult to see just what’s so objectionable about being ‘re-born’ as an animal? From an animal’s point of view, should an animal ever bother to have one, being an animal would be, well, fine. But from a human point of view being an animal doesn’t seem too pleasant a way to exist. Yet animals seem to live according to Nature’s law, seem to do what they should do. No doubt they experience the bases of dukkha much the same as humans do yet they seem able to deal with life and to make a great deal less fuss about living it. Nonetheless re-birth into the animal realm is considered to be a bad thing, an unpleasant experience, mainly because from such a position it’s considered to be difficult, although not impossible, to reach ‘enlightenment’ - not impossible if one is inclined to accept transmigration as a possibility. The ‘human realm’ is said to be the ideal, and to be re-born there is considered to be a very good thing indeed, because humans, so it’s argued, have a much greater opportunity of attaining nibbāna than do the gods, demons, etc., although there’s no guarantee that the opportunity will be seized, that depends very much on our kamma in our previous existences. Hence, it’s said to be necessary that we produce the right kind of kamma, the right kind of ‘action’ during our present birth to ensure a ‘good’ rebirth, preferably, if we can’t be Buddhas, into the human realm so that we can take another crack at it. Now, if we consider the more subtle form of ‘birth,’ that is, birth in the mind of the ‘ego,’ the ‘I am,’ then we can consider ‘hell,’ ‘heaven,’ and so on, as indicating states of mind that occur constantly during the course of this lifetime rather than having to project ourselves off into some future existence to experience them. We can be ‘born’ as an animal right here and now simply by reacting to life in an unwise way; we can be an asura any time we’re consumed with envy or jealousy, or if you prefer, overcome with cowardice; we can be a preta whenever we experience unquenchable desire – which we do most of the time; we can be a hell being if we let the mind blaze with rage or hate; we can be a heavenly being if we arrange matters so that the mind is peaceful and still, concentrated to the point where the spiritual feelings of satisfaction and happiness are experienced. We can even be human, truly human, if, say the Buddhists, we practise life, that is, live with mindfulness and clear comprehension always to the fore in everything we say, think, and do, because then we can avoid ‘birth’ into any of the other ‘realms,’ perhaps permanently. From this point of view the various realms come within reach in this life; it’s not necessary to wait until after death; we can actually experience hell here and now, if we allow it to happen. Looked at from a more conventional point of view nibbāna represents a kind of ‘release,’ a release from the prison of life, from the prison of attachment to the five aggregates – the ‘prison of life,’ as Buddhadāsa put it. Everything that exists in this world is contained within the five aggregates, so, when we’re released from this jail, we’re released from any kind of clinging, and when clinging is gone so is becoming, so is birth, and if there’s no birth then there’s no dukkha - all the unnecessary trouble and strife, all of it is gone. ‘Taṇhā,’ or ‘craving’ is a defiled response to sense experience, a defiled instinctual response, that is, it’s not something we think about first and then indulge in, rather it’s a knee-jerk reaction, something we can’t help, unless, that is, we can apply correct mindfulness in time to stop the defilements from entering the conscious levels and guiding this instinctual response down the wrong street. Once the defilements are gone this quite naturally ceases to happen as the inflows of defilement, the conduits by which the defilements enter, cease to function. It’s then that we’ll be able to stop chasing our tails. For so long as we believe in the aggregates as being ‘me,’ or indeed, as being ‘mine,’ then we’ll be in motion, and constantly. This movement, however, takes place in the mind. Of course it has its echo in our physical and verbal inability to be at rest, but it’s mainly about the mind - mind is, after all, said to be the forerunner in all things, all matters. However, once destruction of the ‘self’ delusion has been fully accomplished there’ll be the mental ‘stillness’ that’s the hallmark of Buddhas,’ the mind that can come quite naturally to rest whenever there’s nothing to be attended to, something which, for the man of the world, can usually only be acquired via the forced concentration obtained during meditation practice. They called the Buddha the ‘Sakyamuni,’ the ‘silent sage of the Sakyas’ because he was possessed of this attribute. Of course Gotama still walked about here and there, still preached, discussed, etc., but his mind was always silent whenever he did these things, silent, void of defilement, void of the delusion of ‘me’ and ‘mine,’ and thus void of any of the stress and tension that normally accompanies human existence because of the craving, clinging, becoming, birth scenario. So, then, if we still feel inclined towards it, we’ll be able to run around without running around, as they say. The mind will be nibbāṇa, will be ‘cool’ once the heat is gone. ‘Heat’ in this case means the heat of the defilements. To love or to hate makes the mind hot to whatever degree. Once the defilements are gone then so is the heat, and the mind is then cool, cool, cool. This heat is the constant movement of the mind, is the sankharas that, initially, arise in dependence on ignorance within the formula of dependent origination. As mentioned, this mind can be brought to a kind of artificial rest by the practice of concentration meditation, and then, when that’s been done, it’s able to taste a little of the flavour of ‘coolness,’ of nibbāna. Experiencing things ignorantly creates conflict, heat, friction. The nibbānic mind, interestingly, will however be capable of deconstructing or reconstructing the illusions at any time: as Buddhas we’ll have the ability to move back and forth between the real and the unreal simply by inclining the mind in such a way that the senses arise and operate as inner and outer, because it’s then that the ‘world’ of meaningful ‘things’ arises. The ‘flower’ can be a ‘flower’ or not for us simply through an inclination of the mind. And what’s true of the ‘flower’ will also be true of anything else, any other concept, like ‘rebirth,’ experience the stopping of the formations and that riddle is solved, because then one realizes that not only is there no answer, there’s no longer a question either, that is, the question has ceased to matter. Mind will be free from doubt, from uncertainty. The end of attachment takes place because the defilements are no longer dominating the mental processes, mind then becomes still and able to reflect ‘things’ as they are. The mind that moves reflects the world of ‘name and form,’ the world of illusion, the world of doubt and confusion. There’s one reality, one truth, say Buddhists, not two, or three, four or whatever, and once we see that then doubt and confusion must disappear. ‘Craving’ comes to an end here. ‘Craving’ is wanting, desiring, which is always foolish. Thus we’ll be free from foolish desire, foolish wanting, but as we’ll still be alive and we’ll still want to eat, to go to the toilet, to do the things we have to do to stay alive and healthy, it’s not as if there won’t be any desire at all, rather that any desire won’t amount to ‘craving.’ Mind free from the disturbances has perfect mindfulness, thus, whenever we have to deal with anything potentially stimulating mindfulness will be there to make sure that we deal with it in the correct way. We won’t have to think about this however, it will simply happen: Mindfulness will bring the right kind of understanding to anything we have to deal with in our lives, so that there’s no projecting of foolishness, of ‘good’ and ‘bad’ the experience can then call forth the correct response and any desiring will be of the right sort. Mind will thus be free from the constant conditioning process it’s normally subjected to. Whenever we meet with anything that causes the mind to linger then mind will be ‘conditioned’ by the experience, that is, we’ll like or dislike and develop some form of agitation as a result. This is called ‘conditioning.’ The Pali word saņsāra refers to the conditioned mind. Some people think that saņsāra means the round of rebirths that we’re supposed to undergo ad nauseam, until we put a stop to it, but saņsāra really has a different meaning, although it still has to do with ‘rebirth’ if we feel inclined to use that word, but the ‘rebirth’ of the ‘ego’ sense into the mind more or less continually during our waking lives is a deeper and more useful understanding of saņsāra. Well, the cycling on in ‘the ocean of birth and death’ – another rendering of saņsāra – and the conditioning that involves, will, once there’s no more attachment to the aggregates, be at an end. The mind will then know true peace, we might even say true happiness, rather than the conditioned kind it normally bathes in. Mind at that time will be ‘radiant,’ illuminated by the light of wisdom. Normally mind is dark, dark with the darkness of ignorance. The radiant mind understands things as they really are. The ignorant mind understands things as they really aren’t. The mind is truly radiant once the ‘fires’ of greed, aversion, and delusion have been extinguished. The ignorant mind is always afflicted by the three roots in some form or another, these are what normally ‘illuminate,’ or influence understanding of our experiences. The radiant mind always has correct mindfulness and comprehension. The ignorant mind always has incorrect mindfulness and comprehension. The radiant mind is at peace. The ignorant mind is prone to restlessness, to laziness, to lustfulness, to irritation, to doubt, and so on. This is the meaning of ‘enlightenment’ – the radiant mind is the ‘enlightened’ mind. The radiant mind doesn’t make mistakes because everything is correctly attended to. The ignorant mind makes lots of mistakes for the opposite reason. Thus, once we’re free from defiled clinging we’ll be the sort of people who don’t make errors, we’ll go through life doing everything right. Quite a thought, that, to never make any mistakes. It’s quite possible to live error-free. What’s more, we won’t be hated for our constant ability to do the right thing, because the ‘ego’ is a spent force then our correctness won’t be a problem for other people, which otherwise it might be. We’ll fulfill the requirement of ‘doing’ without being the ‘doer,’ that is, the ‘me’ who makes all the mistakes will be gone, and for good. When we live in this manner mind is truly contented so that it’s not only bright, radiant, but always has what we might call ‘Dhamma gladness,’ that is, mind is always cheerful, we could say, because everything is correct, and all of the time. Life lived in a true way, with mindfulness and wisdom ever in attendance, is a life of contentment. Usually contentment arises in dependence on the acquisition of some object or some goal, but that’s worldly contentment, and a state of affairs that can’t last. Dhamma happiness isn’t of that sort, it doesn’t depend on the defilements being put to sleep in whatever way but is a result of their having been obliterated, completely removed. Thus it’s not a temporary state of affairs doomed to recede as craving reasserts, but a constant forming the background to life. With the ending of selfishness consciousness could be said to expand. Although consciousness really never contracts it does seem to be contracted when the ‘ego’ is in charge. With this ‘expanded’ consciousness comes the ability to do things naturally, like giving, for instance. It’s easy to give in order to receive, much harder to be truly generous. Equally difficult is helping others without desire for the feelings involved in such activities. That’s the problem with selfishness, it makes it difficult if not impossible to be ‘genuine.’ However, take out the ‘self’ and we will be 100% pure gold, 0% counterfeit, and, because of that we’ll be able to give and to help whoever needs our help with a completely open heart, with completely open hands, without desire for any kind of a reward. As a corollary we’ll lose all our friends and enemies and gain a world-full of Dhamma comrades instead. Every living thing will become our comrade in ageing, sickness, and death. Not just the human denizens of the planet, but everything else too, because, having cut the knots of selfishness we find ourselves a part of, rather than being apart from the great Mother, that is, Nature. Selfishness separates, pitches us into the world of ‘good’ and ‘evil,’ the world of friends and enemies. Minus clinging the sense doors will function quite differently. This has already been touched on above, the fact that selfishness brings a sense of separation and thus causes the senses to operate as ‘inner’ and ‘outer,’ so that, normally, the world of which we’re a part appears as something apart. But we’re a part of Nature, and that will now be the ‘norm’ for us so that, whenever we experience, there won’t be the sense of separation, of being different from the experience. It’s mind that experiences and, in reality, experiences within ‘itself,’ so that the sense of separation is necessarily illusory. Not only that but whatever is experienced through the sense doors won’t lead to problems. While there’s a duality then there’s also the duality of dukkha and sukha to be experienced, and the problems that necessarily flow from them. Becoming necessarily ceases when clinging ceases. ‘Becoming,’ that process which develops the sense of one being the experiencer: what arises at clinging is a distinct sense of separation, but it’s an empty thing, like one of those bubbles put into cartoons to indicate speech or thought. ‘Becoming’ is what fills up the ‘bubble,’ puts the writing into it, as it were. ‘Becoming’ has been compared to a mental pregnancy: ‘Clinging’ is like the fertilized egg in the mother’s womb, and ‘becoming’ is like the development of that egg into the fully formed organism which then gets ‘born’ to experience the world, only the pregnancy here is a mental affair - mind becoming pregnant with the idea of ‘self,’ which then develops until it’s born as the experiencer of a particular experience, as well as of some form or other of dukkha. Of course, if there’s no more becoming then there won’t be the birth of the ‘I’ sense, the sense of ‘I am’ the experiencer, or rather, the ‘enjoyer,’ and, if there’s no ‘I am’ then there can’t be any of the excess forms of dukkha either. Even without the ‘ego’ sense there will still be some problems however, because life has its unavoidable problems. Like pain and discomfort for instance. Life just is an uncomfortable business, it’s also occasionally painful – if one breaks a leg it’s going to hurt, Buddha or not; thus we’ll probably still have to experience the down side of being alive and human but it won’t create the usual mental waves, that will be the great gain. Minus dukkha we’ll know true happiness, the kind that accompanies the silent mind. What this all adds up to is a new kind of life, an artistic life without the sense of alienation, we might say a ‘natural’ life, during the course of which we can operate as Nature intended we should, doing what we have to do to stay alive and healthy, both mentally and physically. What more could there be? The noble eightfold path, the ariyamagga, is essentially what we should be, at least according to Buddhism. In truth we’re not different from our behaviour, but our behaviour is generally more in keeping with the ignoble eightfold path rather than its noble brother. Whether we behave in defiled or undefiled ways seems to be a matter of motivation so it’s convenient that the first factor of the path of eight stages should be ‘right understanding,’ or ‘right view’ – sammādiṭṭhi – the ‘motivator.’ What it motivates are the activities of body, speech, and mind, kammic or otherwise. It’s said that right understanding as the first factor of the path refers to ‘mundane’ right understanding, that is, right understanding of kamma as ‘moral causation’ – do good, get good; do bad, get bad – so that virtuous actions like giving and offering alms have moral significance, good and bad deeds do indeed produce corresponding results(? ), one has a duty to serve father and mother, although not necessarily in that order, there is rebirth and a world beyond the visible one, and that there are teachers who expound the truth about the world on the basis of their realization. All of this actually comes from the texts. But there must be doubt as to whether the power of such a version of right understanding would be sufficient to motivate anyone to change their lives completely, to turn away from the constant seeking of stimulation and instead start to walk the path of purification with its manifold difficulties? Perhaps if some understanding of the defilements and their operation were present there might be a stronger case because then we would know that by behaving in a certain manner we’d be cementing ourselves ever more firmly into the world of relative truth and thus of problems. But even with that knowledge it would still seem an insufficiently powerful motivating force. Thus it does seem that some insight into the true nature of things is necessary, even if that would seem to intrude into the territory of full, or ‘supramundane’ right view. But the texts do make the point that there are those with ‘little dust’ in their eyes as well as those with much, and presumably those with little dust are in that condition because of some deep insight arisen quite naturally at some point during their lives. It does undoubtedly happen, and often too, and it does generally cause quite radical changes to take place in the way life gets lived thereafter. The way that life gets lived thereafter brings us to the second factor of the path, ‘right intention.’ Normally we intend to get what we want – happiness - to avoid what we don’t want – unhappiness - and to ignore anything that doesn’t fit in with our desires. This is greed, aversion and delusion living our life for us. Well, with some degree of right understanding in place we should now be able to stand out against the influence of the defilements - not all at once of course, although we may want to try and do that – and instead of greed etc. the influences of non-greed, non-aversion, and non-delusion, the skillful roots, will begin to make their presence felt. But they need to be encouraged, because old habits do die hard, simply turning off the unskillful roots is an impossibility, and we can expect their disruptive influence to dog our steps into the foreseeable future. But if right understanding is right enough we should be able to resist their siren call, at least some, if not most, of the time. The arising of desire, of aggression, of anger, etc., of that which is harmful in the mind, this is what we need to move away from. Wise forms of wanting, gentleness, friendliness – that which softens the mind, this is what we need to encourage. What softens the mind, gentrifies our intentions, softens and gentrifies the way we function on the verbal level also. Thus intentions manifest on the obvious level in the way we use our ability to speak. Speech here can have the meaning of sub-vocal speech too. Normally our speech patterns are defiled, that is, we use rough, harsh speech, we lie, we backbite, we slander, and so on, in order to get what we want. Well, with the arising of some level of right intention this will begin to change, and we’ll become more careful, more mindful of the way we communicate. And then there’s bodily action to consider, the fourth factor of the path – right action – refers to right bodily action, to how we use the body. As with speech we generally will operate under the influence of defilement, and our physical lives will reflect that. First off, according to the texts, we ‘take life,’ that is we kill things, and often without giving much thought to it, especially if what we kill is small, like insects. But there’s more to this than simply ‘killing,’ we, through the body, ‘do harm,’ that is we have a habit of behaving violently towards our fellow creatures. We steal too, that is, we take what has not been freely given to us whether in exchange for money or not, and we do indulge in sexual misconduct. Thus we misuse the body under the power of defilement to obtain the things we want and to get rid of the things we don’t want. Often it’s the body itself that supplies the required stimulation, and often at a considerable cost to our health, but under the influence of defilement we seldom worry about the cost, until we have to pay the bills that is. So we use the body as the gateway for pleasure, as in sexual stimulation for instance, or in the way of drug stimulation, like alcohol, tobacco, or even stronger forms than these. We use the body violently too, and not just to inflict damage, but to stimulate ourselves violently by throwing ourselves from high places, by running, indulging in excessive exercise of whatever sort so that we can look better, perhaps, or feel better about ourselves, about our physical appearance. And so on, and so forth. And then there’s ‘right livelihood’ to consider, that is, the way we sustain ourselves in this world. All people need food, they need clothing, shelter, and medicine to cure sicknesses with. These four ‘needs’ and the way we go about fulfilling them add up to ‘livelihood;’ whether we practice right or wrong livelihood depends on how well we can control the defilements. Defilement lies behind the desire for luxury – luxurious food, clothes, shelter and medical treatment – so that we can cut down its influence by being careful here. If we have the motivation we should be able to live simply, to cloth ourselves simply and sufficiently, live in a house which is enough for our needs, keep a table which, while necessarily plainer than of yore, would also be enough to satisfy, and keep medicines down to the minimum. While the way we go about making our living can also be given some reasonable attention. Some way of making money that doesn’t do any damage to the Buddhist precepts would be wonderful, although that, in this world, might sound rather utopian. Nevertheless if we’re to keep our conscience as clear as possible then it’s necessary that we find some occupation or profession which is relatively harmless. There are such opportunities in this world, although they might be difficult to find. The effort to accomplish all of this naturally involves the mind, thus ‘right effort’ surfaces as the next factor of the path, that is, the effort to keep the mind out of harm’s way as regards defilement, and, it must be mentioned, to keep it quite deliberately on the path of correct development. To this end it’s necessary to ‘guard’ the mind as much as possible, to be aware when defiled states are present and to be ready to remove them, then be aware when defiled states aren’t present and to maintain that condition. At the same time it’s required that we develop the undefiled condition of the mind – if that’s not a contradiction in terms – by developing it in the way of mindfulness, investigation of dhammas, energy, satisfaction, gladness, concentration, and equanimity – the ‘bojjhangas,’ the ‘factors of enlightenment.’ Through being mindful as much as we’re able of the mental contents we naturally fulfill, to whatever extent, the investigative factor, naturally develop a certain kind of mental energy, naturally develop satisfaction and gladness of mind, and so naturally provide the basis for samādhi to develop. The result of all this can be insight into the way things are, as they say, at which time arises the seventh bojjhanga full and complete,, that is, equanimity towards the world of sense experience. Insight into the true nature of experience is always available to us. At the very beginning of any sense experience the opportunity exists for the mind to become ‘enlightened,’ because there’s an infinitesimally small duration of time available to us before the defilements flood the mind and befog it for us to ‘catch’ the moment and maintain any experience in its original condition. We mentioned the Buddha holding up a flower, a flower is ‘name’ and ‘form,’ but it’s reality is always there too, it’s just that the mind habitually knows ‘flower’ so can’t reach the truth. Hence the practice of ānāpānasati which culminates in a fully controlled mental environment so allowing full awakening to occur. Anybody can experience a flash of insight, which is the usual way such experiences manifest – just a quick glimpse of truth, like a door opening just for a brief moment and then being shut again, but if the mind has been trained, that is, controlled, and fully, then the experience will be prolonged and full awakening can take place. Hence the claims the Buddhists make, that their way is the only way to full awakening - there a lots of enlightened people in this world, but very few, if any, awakened ones. Practising the Buddhadhamma correctly can be compared to turning life into an art form. The art lies in applying certain principles successfully during the living of life itself, day by day, moment by moment. Basically, living life artistically means living in such a manner that we can keep selfishness under control, hence that we’re continually ‘mindful.’ When we’re born we have life in its bare form, straight from the bottle, as it were, and it will develop quite naturally as we grow and mature, but not usually in any way that will bring real benefit to us or to the world we live in. Developing the artist in ourselves amounts to making life into a mutually beneficial experience.